The eastern margin of the Australia plate is one of the most seismically active areas of the world due to high rates of convergence between the Australia and Pacific plates. In the region of New Zealand, the 3,000 km long Australia-Pacific plate boundary extends from south of Macquarie Island to the southern Kermadec Island chain. It includes an oceanic transform (the Macquarie Ridge), two oppositely verging subduction zones (Puysegur and Hikurangi), and a transpressive continental transform, the Alpine Fault through South Island, New Zealand. Since 1900, there have been 15 M7.5+ earthquakes recorded near New Zealand. Nine of these, and the four largest, occurred along or near the Macquarie Ridge, including the 1989 M8.2 event on the ridge itself, and the 2004 M8.1 event 200 km to the west of the plate boundary, reflecting intraplate deformation. The largest recorded earthquake in New Zealand itself was the 1931 M7.8 Hawke’s Bay earthquake, which killed 256 people. The last M7.5+ earthquake along the Alpine Fault was 170 years ago; studies of the faults’ strain accumulation suggest that similar events are likely to occur again. 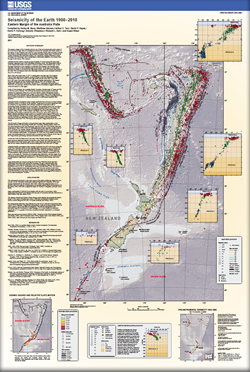 Benz, H.M., Herman, Matthew, Tarr, A.C., Furlong, K.P., Hayes, G.P., Villaseñor, Antonio, Dart, R.L., and Rhea, Susan, 2011, Seismicity of the Earth 1900–2010 eastern margin of the Australia plate: U.S. Geological Survey Open-File Report 2010–1083-I, scale 1:8,000,000.